That from which another person, or something, is named. 1. A false or fictitious name; especially, one that is assumed by an author: One of the most famous pseudonyms known in American literature is that of Mark Twain which is the pseudonym of the American writer Samuel L. Clemens. 2. A name erroneously applied to some other species than that to which it properly belongs: Some people believe that it is a pseudonym to call children "kids" because it has been a term for young goats, foxes, antelopes, etc. before it was applied to humans. © ALL rights are reserved. A descriptive reference to a false or fictitious name; especially, one which is assumed by an author. 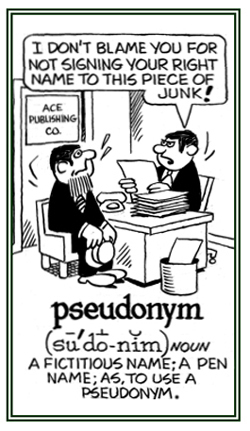 A word derived from pseudonym, meaning a "false name", and which describes a condition of disguised identity resulting from the use of a pseudonym. 1. 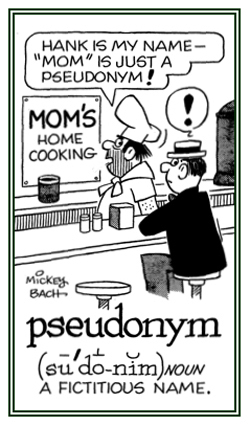 Using, or identified by, an assumed, false, or fictitious (often pen) name. 2. Writing, or written, under a fictitious name. 1. A descriptive term for anyone using, or identified by, an assumed, false, or fictitious writing name. 2. A reference to writing, or that which is written, under a fictitious name. A word that appears to mean the opposite of what it actually indicates: unloosen; inflammable; ingenious; despoil; impassive. 1. A combination of retro- + synonym; a term that distinguishes a subclass from members of a superclass, e.g., “snail mail” is a retronym coined by those for whom “mail” is likely to mean “e-mail”. 2. An adjective-noun pairing generated by a change in the meaning of the noun, usually because of advances in technology. 3. A term; such as, acoustic guitar, coined in modification of the original referent (guitar) that was used alone, to distinguish it from a later contrastive development, again in reference to electric guitar. 4. A noun that has been forced to take on an adjective to stay up-to-date. For instance, "real cream" and "live performance" are retronyms for "cream" and "performance" which have been brought about with the advent of "nondairy creamers" and "prerecorded performances". "Watch" became "pocket watch" as a result of the introduction of the "wrist watch"; "pen" became "fountain pen", after the introduction of the "ball-point pen". A pseudonym consisting of the name of a celestial body. 3. Strictly, a word having the same sense as another or in the same language; more commonly, either or any of two or more words having the same general sense, or having different shades of meanings or implications appropriate to different contexts: Someone has said that Albert Einstein's name has become a synonym for scientific genius. 3. Etymology: from Greek synonymon; from syn-, "same, together" + onyma, "name"; literally, "same name". A reference to a word having the same or nearly the same meaning as another word in the language; such as, "joyful, elated", and "glad". 1. Of, relating to, or referring to words, or phrases, which have the same, or nearly, the same meanings as other words or phrases in the same language. 2. Descriptive of different words that have identical, or at least similar, meanings. To provide an analysis or listing of the synonyms of a word or expression. A compulsion to call a spade successively a garden implement and an earth-turning tool. Coined by Theodore M. Bernstein in his The Careful Writer. Showing page 11 out of 13 pages of 184 main-word entries or main-word-entry groups.